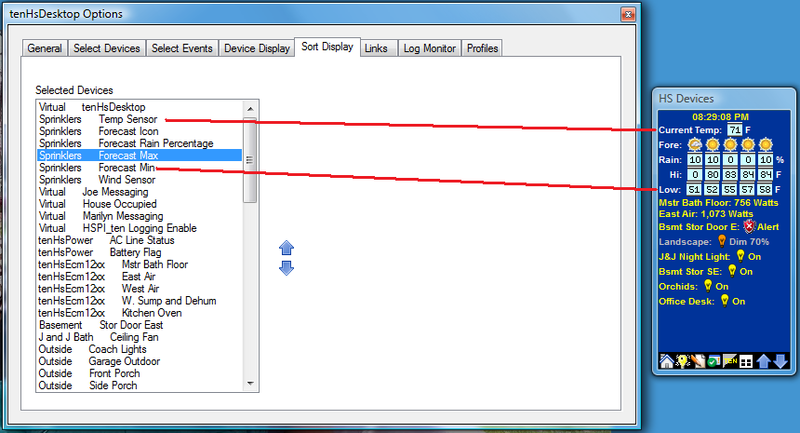 All Devices selected for monitoring will be displayed in the order in which they are displayed in the Devices panel. You can change the display order of a Device by selecting it in the list and clicking the Up or Down arrows to move the selected device within the list. The Devices panel will be dynamically updated as you change the display order. If you click on a Device in the Devices panel while the Options/Sort Display tab is open, the Device you click on will be selected in the sort list (the Device Action panel will also open).